With almost 20 years of reinsurance experience in all classes of business and regions our reinsurance pricing experience is second to none. Analysis of individual treaties when they are for renewal. We work with treaty underwriters and actuaries during their peak renewal season pricing individual treaties and getting involved in all aspects of the negotiations both internally and externally. With our experience clients have the peace of mind that we can hit the ground running from day one and are often very familiar with the treaties they participate in. 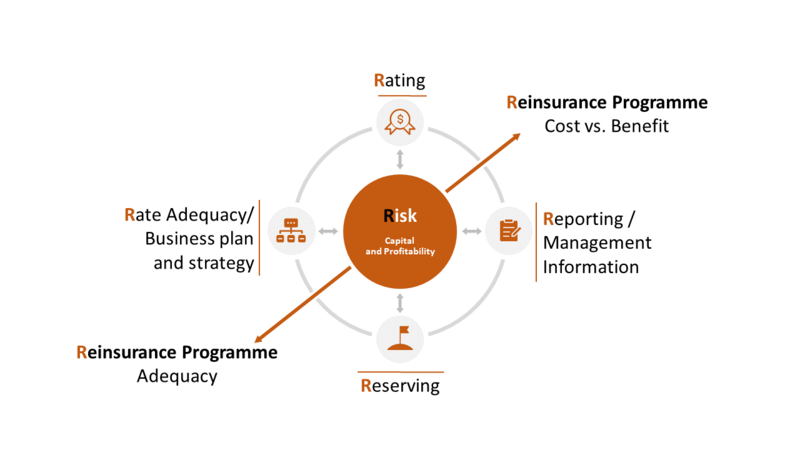 Reinsurance pricing heavily relies on a robust set of benchmark parameters including claims development patterns, exposure curves and increased limits factors. We aggregate data received in multiple submissions by our reinsurance clients to regularly update their pricing benchmarks. Review and enhancement of existing pricing methodologies and models. Nowadays actuaries are involved in all areas of the business and have to communicate complex concepts to insurance professionals who do not have an actuarial or mathematical background. Every day more and more insurance professionals who interact with actuaries want to better understand the numbers presented and how actuaries arrived at these. Our technical courses are uniquely designed for insurance professionals who would like to enhance their understanding of how the 5 R’s of insurance operations work: Rating, Reporting, Reserving, Reinsurance and Risk. We work with insurance professionals from all areas of the business: underwriting, claims, finance and accounting, internal audit and compliance, IT, human resources and actuarial providing tailored technical training that allows all parties to understand how all aspects of the business fit together. Our training courses increase communication and collaboration among departments of insurance companies. The course was very useful – as a refresher and also to get more detailed info with regard to the pricing analysis. Basic statistics for insurance professionals: this course demystifies statistical concepts used in insurance. Fundamentals of insurance pricing: this course is an introduction to the complex world of insurance pricing. Basics of claims reserving methods: this course provides a foundation for those who want to understand how actuaries arrive at their best estimate of reserves. Reinsurance pricing in practice: this is an ideal course for reinsurance professionals who want to better understand the mechanics of pricing. Basic actuarial concepts for non-actuaries: this course provides a thorough introduction to all aspects of actuarial work. Solvency regulation and capital requirements: this course is ideal for those who are involved in risk management and capital modelling. For a complete overview of our training courses for non-actuaries click here or simply get in touch with us to discuss your specific needs. It is one of our aims to raise the technical standards of the insurance industry and the actuarial profession. Knowledge sharing is at the heart of our operations. We do not see sharing our knowledge and expertise as potential loss of future business opportunities. When we consider that it is in the best interest of our client to take ownership of a project internally and retain the intellectual property, we offer our training and coaching services to their actuarial team. Our training and coaching services for actuaries are ideal for busy teams who find it difficult to fit in highly important projects that are not urgent compared to the strict deadlines of reserving and capital modelling. We work with the actuarial team throughout all the phases of the project starting by providing the technical foundation required of the methods to be implemented. We then outline the stages of the project, set weekly targets and identify final deliverables. During the project, we regularly meet with members of the actuarial team to check progress and discuss issues faced; throughout the project they also have access to us on by e-mail and telephone. We peer review their work and test the final product before being signed off. I highly appreciate the contents and the way to explain clearly some sophisticated models. I wish MatBlas a very successful year. Very practical, very relevant, would definitively recommend to my colleagues. You learn all of this taking the exams, but it’s good to put the theory into practice. This course exceeded my expectations (and I had pretty high expectations to begin with!). Efficient use of time as members of the team have access to an expert resource that can lead them during the project saving time researching and testing. Junior members of the team have the opportunity to work on interesting projects that otherwise would be outsourced to external consultants. This increases job satisfaction and staff retention. The company retains the technical skills and intellectual capital acquired by members of their actuarial team for future projects. All members of the actuarial team benefit from the initial technical training provided often allowing them to earn CPD credits for qualified actuaries.. Actuarial managers have peace of mind that someone with the right experience is overlooking the project so that they don’t have to worry about fitting something else in their already busy schedule. Cost effective solutions that are easy to get buy-in for and easy to budget as there is often a pre-agreed fixed fee instead of the risk of escalating hourly fees. Our training and coaching services could be arranged on a one-off basis or through our continuous coaching programme. For more details on our actuarial coaching programme click here or simply get in touch.